Early in the week, a little birdie told me that the Conneaut was primed for action. That's the benefit of having friends scattered across the Alley. I always have the latest pulse on the action. I know several guides who live out east and since I live on the west end, I often know what's going on with the Chagrin, Rock and Vermilion. With that valuable info, I made plans for the trip to Conneaut for Sunday. The night before I thawed out some King salmon eggs and tied a bunch of sacs. When conditions are primed, I'll mostly tie pink sacs. Pink for some reason out produces any other color. In the other container I still had a bunch of skein left over. The kitchen table was a mess of newspapers and paper towels. The smell of eggs overwhelmed the kitchen. But I love the smell of fresh eggs. I liken it to the smell of upcoming victory. It didn't take long to tied over 50 sacs of uncured salmon eggs. I finished just in time for the Ohio State - Penn State game. I cracked open a beer and settled on the couch. I woke up around 5:30A.M and quickly fried up some eggs and bacon. I stopped at the gas station for coffee and hit I-90 for Conneaut. The interstate was a lonely place as the only traffic were weary drivers and truckers heading to some far off destination. The skies were clear and there was a slight breeze from the north. When I arrived it was twilight and there were about 4 cars in the lot. I took my time getting dressed and walked down the river. It was still dark and I couldn’t see exactly what the water was like. As it gradually got lighter, I noticed the water wasn’t that high. Even though the water level was low, it had a tea color. This was probably due to the high number of leaves in the water. Usually whenever the water is tannic that worries me. As leaves start to rot, they release acids and I believe that throws off the fish. Trout are very sensitive to acidic conditions. The first spot was a riffle that flowed into a flat that is considered a winter hot spot because it a tail out. I used a pink spawn sac and casted out. That’s when I noticed the pin had a hard time free spooling. A bushing pin can have a harder time in slower water than a ball bearing pin. I reeled in and popped off the spool. Last night when I was cleaning the reel, I forgot to apply machine oil to the bushing. The bushing was dry and free spooling was out of the question. I decided to make short drifts and work the water. After a few drifts the float went under and a fresh hen came to the surface. I quickly released it and used another pink sac. Several minutes later and feisty little jack took the bait and leaped out the water. I guess the water wasn't terribly tannic here. Not wanting to quickly exhaust my uncured eggs, I switched over to skein. I fished for 20 minutes and had no takers. That’s what happens when fishing bait. One day uncured eggs work and the next they want skein. I switched back and didn’t have any takers. 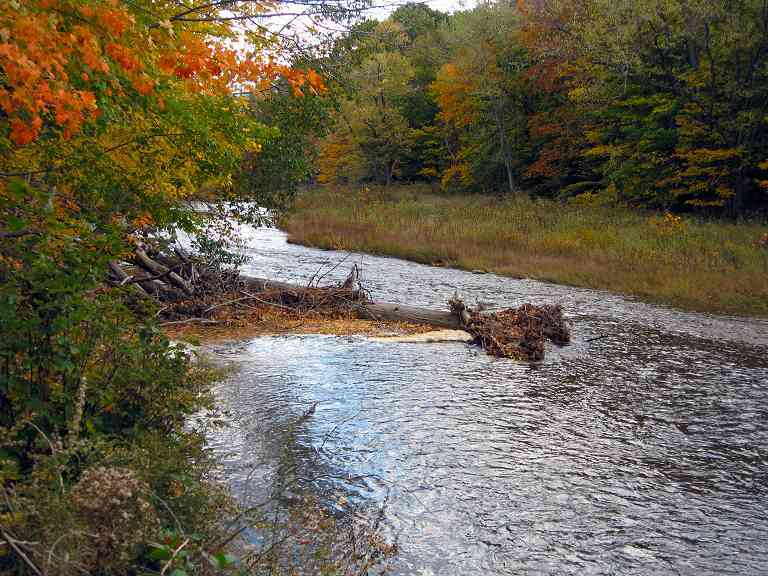 I moved farther upstream in search of fishable water. I was somewhat surprised to see hardly any people for a Sunday. 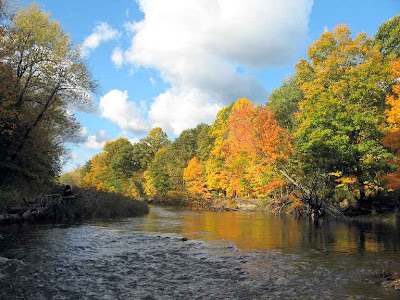 Usually the Connie is the hot spot in the fall, because the creek is stocked with PA steelhead. I putzed around several riffles and couldn’t stir up a player. It was now 10:30A.M and I decided to gun and run. Gun and run is my style for getting into fish quick. When using eggs, steelhead will take it fairly quickly. I don’t bother wasting an hour fishing one hole hoping that a fish will bite. If there isn’t any action quickly, it’s off to the next spot. That’s why I usually fish alone because most people don’t like this method of fishing. I swear by it and that’s why I catch a lot of fish. I made it back to the bridge and blew past the guys fishing under it. I got about 100yds downstream and found another favorite spot of mine. I used another pink sac and started drifting along the seam. The float got hammered hard and I quickly set the hook. 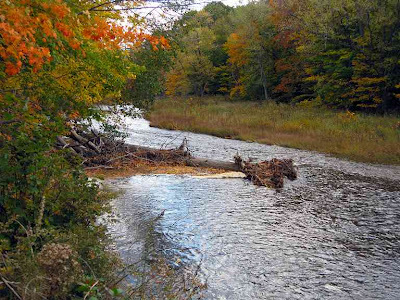 A large steelhead broke from the water and raced downstream. I darted back and forth and raced for any cover. It was a plump male in full color. By now, the sun was starting to peek through the clouds. It was a decent morning, but not great. I started getting into fish when I fished the faster water. I caught nothing in the slower stuff. 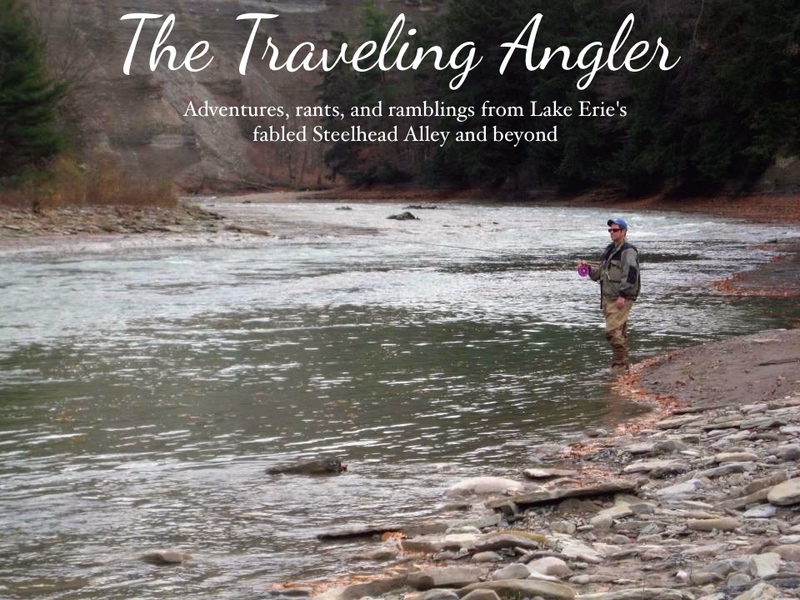 Out of the all of the Alley's streams, the Conneaut is the more classic trout stream – riffle, run and pool. I starting banging away and the fish started to hit. All they wanted was the uncured eggs and thumbed their nose at the skein. I ended up have a good day considering there were quite a few people fishing. These spots have been fished hard over the past week so I was happy that I did well. Currently all of the streams are dropping fast. The water table has been so dry that the ground soaked up all of the rain fairly quickly. I wouldn’t cash in the vacation days or use the 24 hour flu excuse yet. There are fish in the rivers, but they’re spread out. You need to do a lot of leg work and work the water. If you do go out, fish the lower sections. We need another good dose of rain and unfortunately there isn’t any for the rest of the week.